Thanks to input from all of you who responded to my Facebook and Instagram post, I decided (wait, you convinced me!) to hang a couple traditional red & green quilts and then the rest in blues & whites. Well, I started getting out the Christmas quilts yesterday and I had more than I thought! And there are even a few more that I didn't hang! So I went all Christmas .... I'll leave them up through early January and then switch out to Winter. 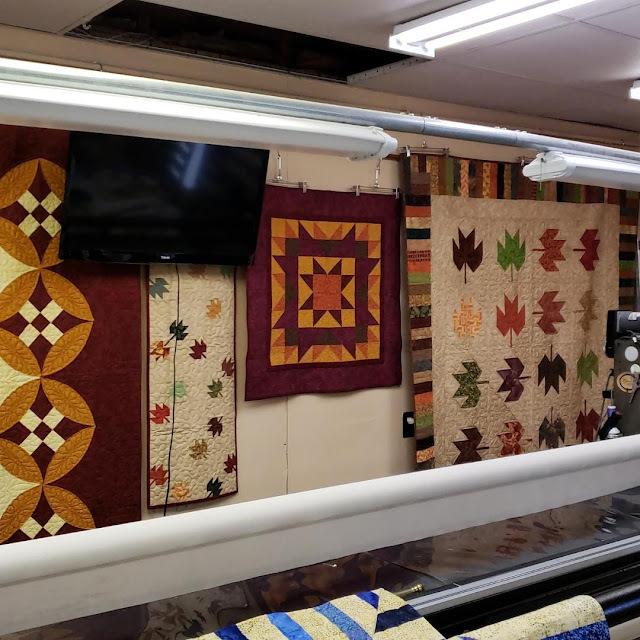 When I posted the photos of the Fall quilts on social media, I got a lot of questions about the quilts and if patterns were available. So in this rather long post, I'll give you all the information as well as the links to the patterns or publications the quilts were featured in - that will make it easy for you to find the pattern and the fabrics too! Tree Time, while looking a little wrinkled from being stuffed in a tote of Christmas quilts, originally appeared in Annie's A DIY Quilted Christmas a few years ago. This fun wall hanging stitches up quick with a touch of applique! 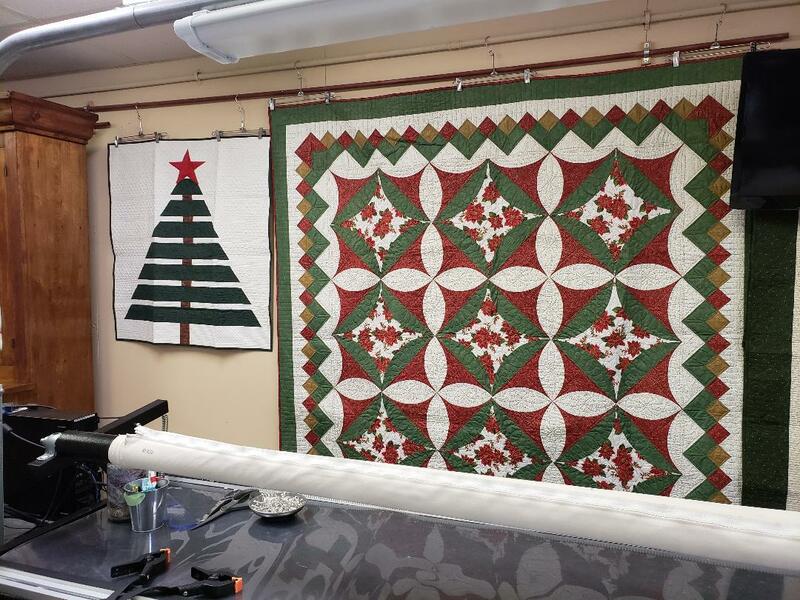 A Christmas Legacy is on the far left - this gives you a better look at the pieced border. Poinsettia Bed Runner, hanging under the monitor, is from my Masterpiece Quilting 2018 Christmas Collection Book, available on Amazon and eligible for Prime shipping. Order today and you can still get it and have it under the tree as a gift to yourself or your favorite quilter! There is a matching pillow that goes with this bed runner too. Jingle Bells Wall Hanging, across the top, is the perfect horizontal wall hanging to fill in an empty space above the mantle or over a buffet. The pattern is part my Masterpiece Quilting 2018 Christmas Collection Book, available on Amazon or as a stand alone pattern in my Craftsy store. Tree of Presents is a bit of a cross-over quilt. It's Christmas I used one of my favorite shades of blue along with some "blingy" fabrics to make it. The pattern is also part my Masterpiece Quilting 2018 Christmas Collection Book, available on Amazon or as a stand alone pattern in my Craftsy store. And on the far right, a small sliver of Christmas Friends is showing. Christmas Friends is the cover quilt on my Masterpiece Quilting's 2018 Christmas Collection book available on Amazon. Fabrics are Kona solids by Robert Kauffman. The Table Runner, hanging vertically in the corner, from my Learn to Machine Bind Your Quilts online class & DVD. The fabrics used were Toscana from Northcott. A Little Bit of Christmas, is folded in half to hang, so it's actually twice this size. This quilt was originally published in Quilter's World Winter 2016 Magazine, which is still available digitally, and I also had the pleasure of teaching a class on it with Annie's Creative Studio so you can not only get the pattern but learn to make it step-by-step. 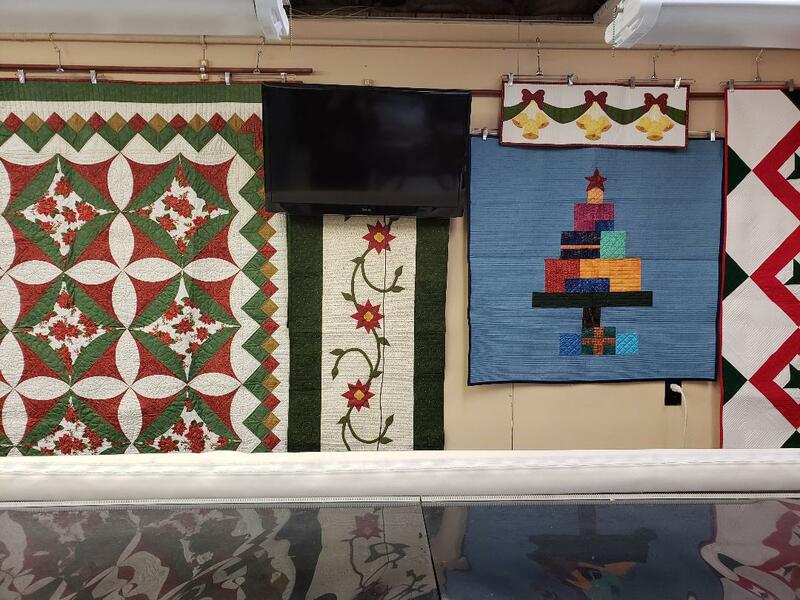 So now you have all the information and a quick tour of the quilts that I have hanging in my studio for Christmas. Yes, I have a Gammill Statler computerized quilting machine that you see in the photos. 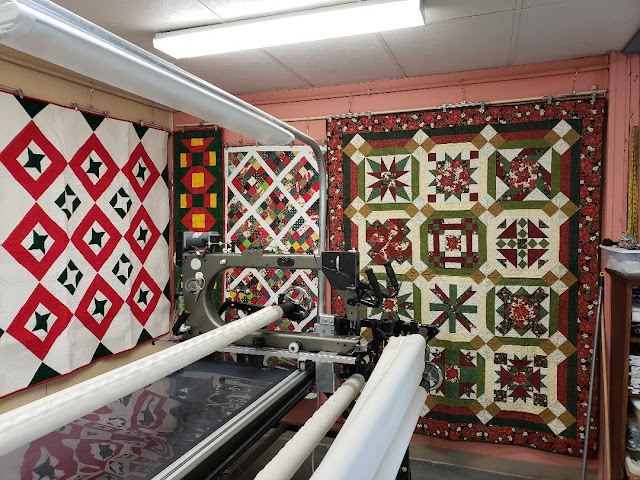 All of these quilts have been quilted on this machine too. For the video tour where I explain the quilting on each of the quilts - click over to my YouTube video. Enjoy! Beautiful quilts, Nancy! You are an amazingly talented quilter! Beautiful quilts, thanks for the tour!